"Today that boiler is still visible from the beach, a boxy metal structure rising a few feet above the top of the water. From the shore it's easy to mistake for a rock or chunk of concrete, and for years I saw it without giving it a second thought. 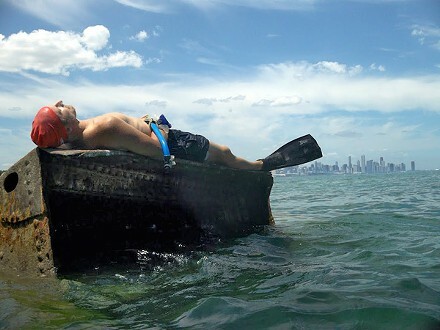 Last August, on a bike ride with a friend, I passed the concrete blocks that separate the beach from the Lakefront Trail and noticed a sign colorfully markered on a dry-erase board: SHIPWRECK TOURS 10:30-NOON, FREE."